I used to be a huge proponent for year round homeschool. I declared that we would school all summer and that we would take longer breaks during the school year instead of taking one long summer break. Umm, so I’ve sort of changed my mind. There is something to be said of enjoying the sunny summer days and having a bit of down time. There is also something to be said of capturing the back to school excitement and using it to help motivate you to begin a fresh, new school year. Also, I’ve learned that I need a bit of a break and a slight change of schedule. I’ve found that homeschoolers tend to be very passionately on one side of the fence or the other. Where do you fall in this debate? Pro summer school or pro summer break? I used to be adamantly pro year round school. No longer. You can read more about my thoughts right here…. What should you do? Take that summer break or keep right on working through the summer? Here are a few reasons you might want to consider that summer break…and I’ll also give you a few ways to sneak in some summer learning while still being able to take a bit of a break from your regular routine. It’s summer. It’s finally sunny here and I want to be outdoors and enjoy the weather. You know what else I want to enjoy? My kids! Sometimes I feel like I’m only a home educator and I have forgotten how to be a mom. Have you ever felt that you have that way? So, I’m taking summer to just do fun things, spontaneous things, messy things, restful things…Mostly I just want to “be” with my kids and be fully present without thinking about schedules or our routine or homeschool planning. Do you worry that your kids don’t have enough time in their schedule to pursue all of their own interests? Maybe you should find time in your schedule for your kids to be bored – that’s when their creativity can truly soar. Sometimes I feel like the stress and busyness of the school year leaves zero time for fun in my day. I want my kids to have time to recapture that feeling and have lots of time to explore, play, create, and imagine. Summer is the perfect opportunity to encourage free play. Who has ever felt tired and burnt out with the homeschool life? I know I certainly have. I sometimes feel like it’s a frantic race to fit in all the subjects and complete all the curriculum. But have you considered that your kids might feel the same way? Their days are full of wonderful learning opportunities and enriching activities. However, they might need a break to simply rest. When was the last time you read a book or pursued your favorite hobby? Well, summer is a wonderful time to fit in even more time for yourself. Because Homeschool Mom, you matter too. Maybe your kids don’t need a break, but you really do. Take that break. You have my permission. I like to use my summer to read books. I also listen to encouraging podcasts and webinars. I read books about education and blogs about homeschooling styles. I spend time on self-education and pursue some of my own interests. I’ve found that when I spend more time on self-care during the summer, I feel refreshed and don’t struggle with as many feelings of burnout during the next school year. Do you know what I focus on the most during the summer? It’s not school. It’s chores. I spend a lot of my time during the summer teaching my kids how to properly help around the house. We also do a deep clean of the house at some point in the summer. Guess what this means for our new school year? I have kids who have been trained in new chores for the upcoming year and they are actually helpful in keeping the house more orderly and clean during our busy homeschool year. It is amazing! But what about learning loss??? Ahh! That’s one thing that everyone worries about when discussing the debate about year round schooling. If I take a summer break my kids’ brains will fall out and they will lose all of our progress!! Right? I don’t take a complete summer break with zero school activities. Instead, I’ve found a sort of balance. If a child has struggled in a particular subject, we often work on that subject through the summer – especially if the curriculum for that subject has not yet been finished. That way I know we are working on that child’s most challenging area. I focus mostly on math and reading – my kids do some math workbooks, math games, flashcards, or math apps through the summer. Math is one area where long breaks can cause a huge loss of progress so I never sacrifice our math studies. It’s the same with reading – I have my kids read aloud every day as well as have daily silent reading time. Add in the extras – For summertime, I put a focus on the extras that are often squeezed out during our homeschool year. This means that we often do art in the summer. We do composer study and listen to different styles of music. We work on typing skills, and this year I have a child working on coding and game design. We complete history projects and do more hands-on science. By the end of a regular school day I’m often too tired to worry about the subjects that are extras or the projects that are time consuming and messy. So I stick these into our summer routine! Try interest-led learning through the summer. Instead of doing our regular school routine, I try something new. I figure out what my children are most interested in and do a few months of unit studies. If it’s too hot to go outside, we do some video school and watch movies and videos about interesting topics. We’re still learning but our days are more flexible and more laid back. So, do we school year round? Not technically. We now take a summer break of at least 2 months. However, those months are full of learning activities to make sure my children still have a functioning brain by fall. Yet, we all feel like we have a nice break before the start of a new school year. I encourage you to evaluate if you need to take a summer break. It’s ok to admit that you need to take that time off. It’s ok to schedule your school more around the public school calendar to take advantage of times when friends are out of school. It’s also ok to vary your plans year by year. This is what I have done. Over the years I’ve realized the benefits of a less structured summer time break so that I feel refreshed and motivated for a new school year each fall. I’m a homeschooler who doesn’t school year round right now. I’m taking a summer break. You can find me at the pool, on the golf course, or at the park. I’m going to read some books. My kids are going to relax and be lazy. I’m going to rediscover my identity as a mom. It’s going to be great…until I’m really tired of it. But then it will be time to get back to homeschool and I’ll really appreciate a more structured routine! Have you found balance with your homeschool schedule? 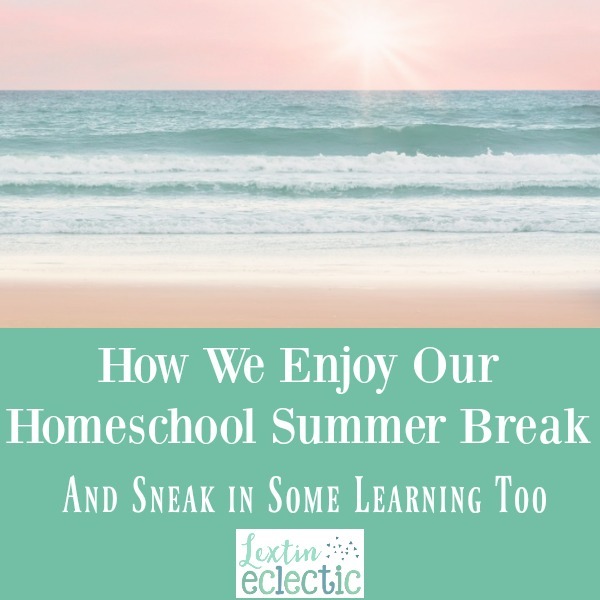 A summer break might be exactly what your homeschool needs to bring a renewed focus and motivation! I’m so glad you’re having a great summer so far! I think it can be really valuable to take some time off and let kids pursue their own interests and even be bored at times – it’s good to foster their creativity!